Breakway was produced and largely composed by another labelmate, keyboardist Nate Harasim, who won a BET Award and earned a Grammy nomination for his role as composer and keyboardist on Dave Koz’s Hello Tomorrow and has also worked with Darren Rahn and Steve Oliver . 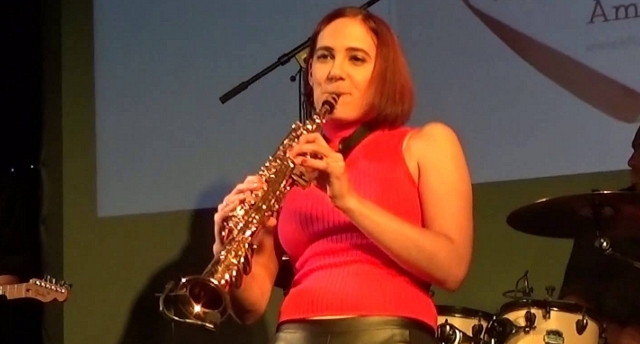 Mis, a native of Cleveland who started playing clarinet around age nine before switching her focus to sax a few years later, vibed with Harasim immediately when the two got together at the suggestion of Trippin N Rhythm President and Founder Les Cutmore. Cutmore was intrigued by Mis’ potential upon hearing Forever & Ever, the first album she had recorded several years earlier—which was produced by guitarist Paul Brown, one of the top artists and behind the scenes names in modern urban jazz. Mis had hooked up with Brown as an ambitious teenager in 2007, asking him if she could sit in with his band when they played at a club in Cleveland. When he said yes, she ran home and got her horn and jammed with them that night—a performance which inspired Brown to agree on the spot to produce her debut. Paul is an awesome producer and I love his old school approach because I’m a big fan of old school jazz and R&B, and it was great to have the opportunity to work with him at such a young age. “Les liked what he heard from me,” Mis says, “but the process of being signed started out with me doing a song first with Nate, who has a production as well as an artist deal with the label. “The first song we worked on was ‘Breakaway,’ and soon after Les heard it, he offered me a deal. “Nate brought a new energy and helped me create a new sound that’s what this next generation of players should be,” she adds. “He has a unique vibe and technical background and has a synth flair like I’ve never heard before. I never properly marketed that first CD, so for many people Breakaway will be their first opportunity to hear me play. The album shows a lot more maturity and confidence, and reflects a lot of the excitement of the live performing that I have done these past few years. Since early on in my career, one of my goals was to be one of first who would change the way smooth jazz is heading. The genre needs something fresh and new. And I feel that Breakaway represents all of that. It’s exciting to have the opportunity to bring something new to the table that goes against the stereotype of this genre being strictly for middle aged or older fans. I want to show young fans from my generation that contemporary jazz is really fun and cool. While she is still based in her hometown of Cleveland, Elizabeth Mis has come a long way since she was that wide eyed, Kenny G loving home schooled kid who devoted all her spare time to practicing her music and performing around her community – from churches to mall openings. “My tone pretty much came to me,” she says. “I had no idea it was unusual or special. It was just what I did – a God given gift that I could blow like I did the very first time I picked it up. Sometimes I did two performances in one day – and learned quickly that mixing the horn out of my favorite Dave Koz and Kenny G songs, and playing them myself, was a big crowd pleaser.” In more recent years, Mis has brought that same passion – but with original material – to much higher profile performances, including the all-star KSBR radio station bash in Southern California and the Bob Hope Theatre in Stockton, California, where she opened for Gentlemen of the Night (Marion Meadows, Michael Lington, Paul Taylor).